I have made it using a handmade solid silver dome - which has then had a stunning quartz Stalactite cabochon set in the centre of the dome. The dome itself is skilfully made from a single sheet of silver which is hammered into shape with various punches and a doming set. 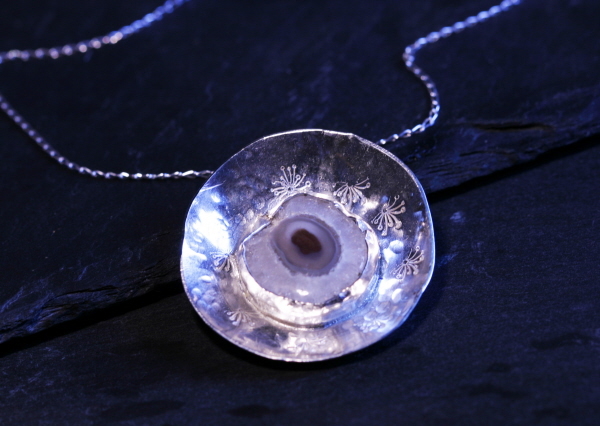 This is then hammered and polished - and when set with the Stalactite slice cabochon in the centre has the most incredible effect! The reflective nature of the dome magnifies the shimmer of the silver. The necklace comes boxed in a high quality velvet lined jewellery box - and even comes nicely gift wrapped in blue tissue paper.